Moving away from the Scottish scenery of her last two novels, Rachael Lucas has set Coming Up Roses in rural Buckinghamshire but it feels like it could be set in any traditional village anywhere in the UK (observed by one who comes from a very small village in Lancashire) with its large houses, beautiful gardens, the village fete, various committees and obligatory cricket pitch. Coming Up Roses is what I call a 'comfortable' (or 'comforting') read. You quickly find out the role of the main character, Daisy, and sympathise with her plight. You also are introduced gently to the other main players and their presence feels just right; not written to pad out a story line and not overpowering from the main thread of storytelling. I do feel as though sections of the story could have been expanded on. For instance, the story is set over a period of a few months and the blossoming friendship between Daisy and her two new female friends, Elaine and Jo, seems to take a leap from them just getting to know each other to them being very comfortable in each other's company. But maybe there's a whole other novella waiting to be written... Also, there are various love interests dotted around the book which I feel could have been explored more but at almost 400 pages, this book is long enough and more I do feel that more tangled webs would have detracted from the end point. And sometimes we just want a happy ending, don't we? Coming Up Roses is a perfect bath time, "snuggled up on the settee with a hot chocolate" or holiday read with a couple of genuine laugh-out-loud moments (especially the predictive text moment where Daisy sends 'fud odd, you absolute arsenal') which rarely happens in books for me. I think there's definitely a few more retrospective stories to explore from some of the characters in the book (Thomas and Flora, for example). 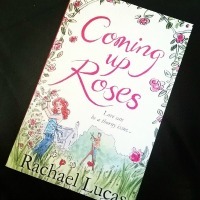 Rachael Lucas has firmly and comfortably placed herself in the middle of the chick lit and romantic novel market and her latest book, Coming Up Roses, absolutely confirms that. Coming Up Roses is available for pre-order on Amazon now and is due for general release on 21st May 2015. Rachael and myself have been writer/blogging friends for five long years now and it's been wonderful to see her writing career really take off. I mention this more in Rachael's Soundtrack To My Life article from last year. In the very near future, myself and Rachael are going to grab a coffee together and have a video chat about her rise to 'Kindle Top Ten Bestseller' so if you have a burning question for Rachael or want any top tips about self-publishing or how she secured her publishing deal let me know in the comments, on Twitter or by email and we'll cover those in our video.